DTCC’s FICC/MBSD Operational Novation initiative celebrated its first full year of operation in October 2018. 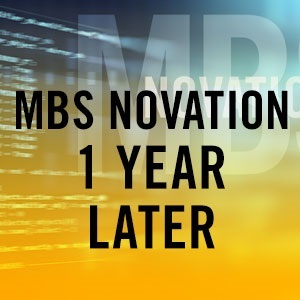 The completion of this initiative was a major improvement for clients and the industry because it greatly streamlined and simplified mortgage-backed securities (MBS) netting and processing. In the first 12 months of production, moving from bilateral settlement in all MBSD To-Be-Announced (TBA) eligible CUSIPs to the new central counterparty (CCP) model, 63% of transactions settled for cash, which reduced the overall number of electronic pool notification (EPN) messages and eliminated securities settlements, fails and other costs for clients. The DNA process gives a client the ability to inform FICC if it does not want to receive or send pool information. This process allows clients to pair-off trades facing FICC buys and sells. A TBA is a contract for the purchase or sale of a mortgage-backed security to be delivered at an agreed-upon future date because as of the transaction date, the seller has not yet identified certain terms of the contract, such as the pool number and number of pools, to the buyer. Since November 2017, clients have successfully used FICC as the single CCP for TBA netting and novation transactions. As a result, clients have been able to net away 63% of processing transitions with the introduction of the new DNA (do not allocate) process. Before operational novation, MBSD processed 2.46 trillion in TBA volume, but after operational novation, that number jumped to 5.1 trillion. With the introduction of the DNA process, the volume doubled for the first 12 months of operational novation being live in production. 71% decrease in trades that needed to go to settlement.